With over 75 million records sold, 5 Gold records, 5 Number One hits, American Music Awards, a popular television variety series, movie and television appearances, appearances, Joyce & Pam Vincent are two-thirds of "Dawn" who’s “Tony Orlando & Dawn” became Pop Icons that are forever etched in American Pop Culture. Along with Telma Hopkins and Tony Orlando, the group became an international sensation. Joyce and Pamela Vincent continued their impressive careers as session singers as well as performing around the world. As members of the Inspirational Voices of Free gospel group, they have appeared on an annual Christmas special broadcast from the Dorothy Chandler Pavilion in L.A. Joyce has also filled in as a member of FLOS in live performances in London and Japan after family tradgedies prevented Lynda Laurence and Freddi Poole from performing. In the early 70’s, she was asked to join another more established and successful group on the Stax Records label – The Emotions! Without hesitation, Theresa stepped into the famous sister group, replacing the oldest sister, and remained with them for four years, working with legendary producers Isaac Hayes and David Porter. Together, they recorded 4 hit albums, most notably, "Untouched," "Chronicles," and “Sunshine.” There were also several successful single cuts from the group that were released on the Volt label, such as 'The Touch of your Lips,” “I Call This Loving You,” and "Put A Little Love Away,” and the holiday classic “What Do The Lonely Do At Christmas” which is one of the most requested Emotions songs. Another album “Songs of Innocence and Experience” was issued on the Ace Records label in the UK in 2004, featuring previously unreleased songs. Theresa left The Emotions to pursue a solo career, recording an album for Stax. At the same time, she began doing print ads, jingles, and voice-overs. She is a much sought after studio vocalist and arranger and has worked with many well-known recording artists, such as The Chi-Lites, The Dells and The Manhattans. In addition to performing around the world, she can also be seen with The Emotions in the “Wattstax” movie, which recently had its 30-year anniversary re-issue. As a solo artist, Scherrie has had hits with "I'm Not In Love" (which featured her sister Freda and former original Supreme Mary Wilson on backing vocals), and most recently, “One Night Only” from the “Dreamgirls Dance Project.” As special guest star at the “If My Friends Could See Me Now” fundraiser in 2007 she wowed the audience with her high-energy version of the song, backed by her childhood friends and fellow Detroit natives, Joyce & Pam Vincent. Dictionaries descripe the word "Tour De Force" as a "master stroke, performance, piece deresistance, stroke of genius," and "A feat accomplished through great skill and ability often deliberately undertaken for its difficulty." All of these descriptions easily fit this conglomeration known as Tour De 4Force!. This 5 member group comprised of former members of three well-known and highly successful singing groups and Jim Gilstrap, who is considered to be one of the most prolific and successful session singers in the industry - unite in an historic new group bringing new and old fans a new experience in Smooth Jazz, Pop and R&B music. "Quiet Moon" is the freshman CD from this ambitious new group, who also gathered the support of many other successful and respected artists - including former Temptations lead singer, Ali Ollie Woodson. Woodson's vocals are featured along with the groups on the Gilstrap-penned "Four Walls" and on "Heaven Bound," a song originally recorded by Chaka Khan & Rufus under the direction of Quincy Jones. TC Campbell, a former member of the 80's Funk group Cameo also added his talents as the Musical Director and Co-Producer on the project. 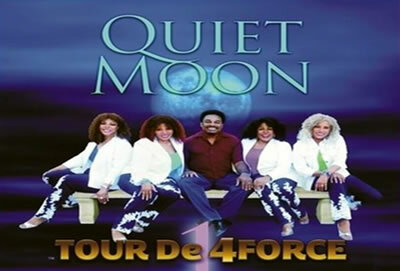 Other noted musicians contributing to the smooth sound of “Tour De 4Force “Quiet Moon” include saxophonists Aaron Fletcher and Derrick Edmondson, acoustic guitarist Maitland Ward and rhythm guitarist Ray “The Weeper” Fuller (George Duke), percussionist Munyungo Jackson (Stevie Wonder), bass player Larry Ball (Smokey Robinson), and drummer Mike White (former member of “Maze”). "Godsend" is the first single from Tour De 4Force's first CD, "Quiet Moon." The groups smooth harmonies form a signature that adds to the songs bouncey, feel-good smooth groove. Buoyed by the support of loyal fans who have followed the careers of these talented performers through the years, Tour De 4Force is already enjoying a favorable response to their formation, as evidenced by the multitude of hits to their music playlist on their Myspace page - over 350,000 in only 3 months!.